Actinidia deliciosa, kiwifruit, is the type of kiwi found at the grocery store. It can only be grown in areas that have at least 225 frost free growing days with moderate winter temps – USDA zones 8 and 9. If you love the flavor of exotic kiwi but don’t live in such temperate zones, fear not. There are about 80 species of Actinidia and several types are cold hardy kiwi vines. A. deliciosa is native to Southern China where it is considered to be the national fruit. In the early 1900’s, this plant was brought to New Zealand. The fruit (actually a berry) was thought to taste like gooseberries, so it came to be called “Chinese Gooseberry.” During the 1950’s, the fruit became commercially grown and exported and, thus, a new name was coined for the fruit – kiwi, in reference to New Zealand’s furry, brown national bird. Other species of Actinidia are native to Japan or as far north as Siberia. These cold hardy kiwi vines are suitable types of kiwi for zone 3 or even zone 2. They are referred to as super-hardy varieties. A. kolomikta is the hardiest and suited as a zone 3 kiwi plant. Two other types of kiwi for zone 3 are A. arguta and A. polygama, although the fruit of the latter is said to be quite bland. Actinidia kolomikta – Actinidia kolomikta, as mentioned, is the most cold hardy and can tolerate lows down to -40 degrees F. (-40 C.), although the plant may not bear fruit following a very cold winter. It only needs around 130 frost free days to ripen. It is sometimes called “Arctic Beauty” kiwifruit. The fruit is smaller than that of A. arguta, but delicious. The vine will grow to at least 10 feet in length and spread 3 feet across. The foliage is lovely enough to use as an ornamental plant with variegated pink, white and green leaves. 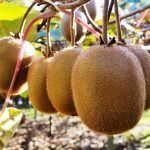 As with most kiwis, A. kolomikta produces either male or female blossoms, so in order to get fruit, one of each need to be planted. One male can pollinate between 6 and 9 females. As is common in nature, the male plants tend to be the more colorful. This kiwi thrives in partial shade with well-draining soil and a pH of 5.5-7.5. It doesn’t grow too fast, so it needs very little pruning. Any pruningshould be done in January and February. Many of the cultivars have Russian names: Aromatnaya is so named for its aromatic fruit, Krupnopladnaya has the largest fruit and Sentayabraskaya is said to have very sweet fruit. Actinidia arguta – Another kiwi for cold climates, A. arguta is a very vigorous vine, more useful for ornamental screening than for fruit. This is because it generally dies down to the ground during cold winters, thus doesn’t fruit. It can grow to more than 20 feet in length and 8 feet across. Because the vine is so large, trellises should be extra sturdy. The vine can be grown on a trellis and then lowered to the ground before the first frost. It is then covered with a thick layer of straw and then snow covers the vine. At the onset of spring, the trellis is brought back upright. This method preserves the vine and the flower buds so the plant will set fruit. If grown in this manner, severely prune back the vines in the winter. Thin out weak branches and water sprouts. Prune out most of the vegetative canes and cut back the rest of the canes as far as the short fruiting spurs. Read more articles about Zone 3.